Hello, My name is Sue DuPont, the mother of 22 year old Ernie DuPont. Ernie was 17 years old when he was diagnosed with Degos disease. He was a senior in high school and was a great athlete. He was the goalie of the varsity soccer team and broke the sit up record for the high school he attended. He is also a wonderful person and son. He is a man of character. He was 15 when we saw his first spot and honestly we thought it was a pimple or something like that. We took him to the pediatrician and he said he had no idea what it was and said try to put neosporin on it for awhile. nothing happened it stayed the same. over the years he got more on his chest and few on his back. The summer of 2009 my sister in law said she thought it was molluscum contagiosm, and that is what the pediatrician said at his 17 year old check up in January 2009 as well. I wasn’t satisfied and took him to the dermotologist. He did a biopsy on one of Ernie’s reddish premature lesions and a week later told us it could be either lupus or Degos disease and that he needed another biopsy , this time a deeper tissue sample of a mature white centered lesion. We immediately went back the next day and had that done. 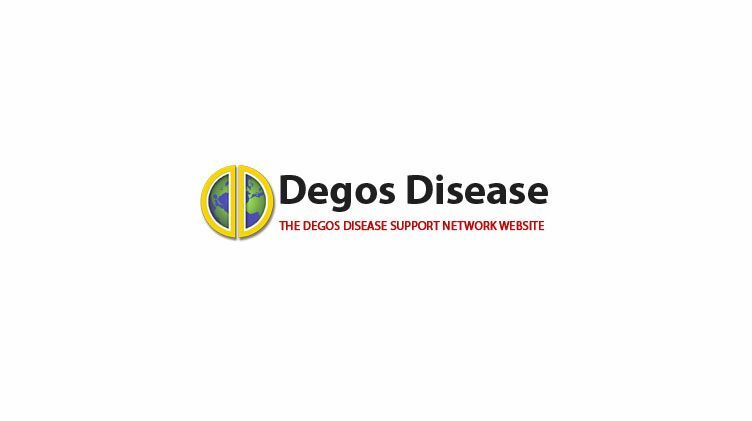 In the meantime we looked up about Degos disease because we never heard of it. It was devastating! Finally a week later the dermatologist called and gave us the definite diagnosis of Degos disease. No one in this area of New York or the states that we or the doctors knew of knew anything about Degos. We were referred to Dr. Lee Shapiro, a rhuematologist , who also never heard of it before, but said “He was on the case” and thank God he was. In Dec. 2009 xmas night Ernie got seriouslly ill, with pain and vomiting and fever. He had an obstruction from perforation that had healed itself and caused obstruction. the surgeon fixed the obstruction and closed him up. He told us Ernie’s intestines were covered with lesions. More devastating news, because we knew, based on what we read and what Dr. Shapiro had found out from the Degos disease website experts, that these patients have all died before that point. While Ernie was in the PICU of Albany Medical Center, dying from sepsis, Dr. Shapiro found a doctor in Cornell that had treated a similar individual with a drug called eculizamob and almost within a few hours improved and is still alive today. Dr. Shapiro got in touch with the doctor of the drug company and they sent it to Ernie as fast as they could. There was a day delay from bad weather, but he received it 2 days later and within hours his vitals started returning to normal. it was truly a miracle. I will elaborate on that some other time. So you see at that time to our knowledge, Ernie was only the second person to survive this type of systemic degos. Of course over time more communication between Dr. Shapiro and other doctors interested in Degos has taken place. Ernie was able to get a tutor and go back to school and graduate with his class. He did continue to have progression in his brain and bladder, but both of those have been resolved, from the eculizamob being increased for a time and he has also been on remodulin, a vasodialator, for 3 and 1/2 years. That is a story for another time. That is also a miracle story. In September of 2013 he had a left lung plueral efffusion, which has also been resolved, with an increase in eculizamob for a time. He is back to every other week again on the eculizamob instead of every week and his lung is barely draining enough to cover the bottom of the bottle. Hopefully the pluerax tube will come out very soon. My son has been through things that I don’t think I would have survived. He is literally my hero. He is the strongest person I know. He has been as low as the most low and has come back. He has had panic attacks and suffers from anxiety as well at times. . Finally, my daughter Jennifer who is now 17 was diagnosed at 15 with Degos disease. She got her first lesion at 15 just like Ernie so of course we immediately knew it was Degos. She has been on 81mg of aspirin daily only and has not progressed like my son. Dr. Shapiro believes she only has cutaneous Degos and will not get systemic. We are hopeful.